Surprise your guests at your next party with these exotic cocktails. Here are a number of luscious Asian-inspired cocktails fit for any celebration, from New Year's Eve to a summer party. From mango margaritas to a Singapore sling, this selection of 12 delicious drinks brings the faraway flavors of the East to your next soiree. Created in honor of the 2008 Beijing Summer Olympic Summer Games, here is a fun drink that takes a twist on the traditional Bellini by replacing the peach schnapps with lychee liqueur, which offers a stronger flavor. If you have trouble finding lychee liquor, you can blend lychee nuts in their own juice in a blender or food processor. The unique flavor of mango comes to life in this simple margarita recipe that has only three ingredients. 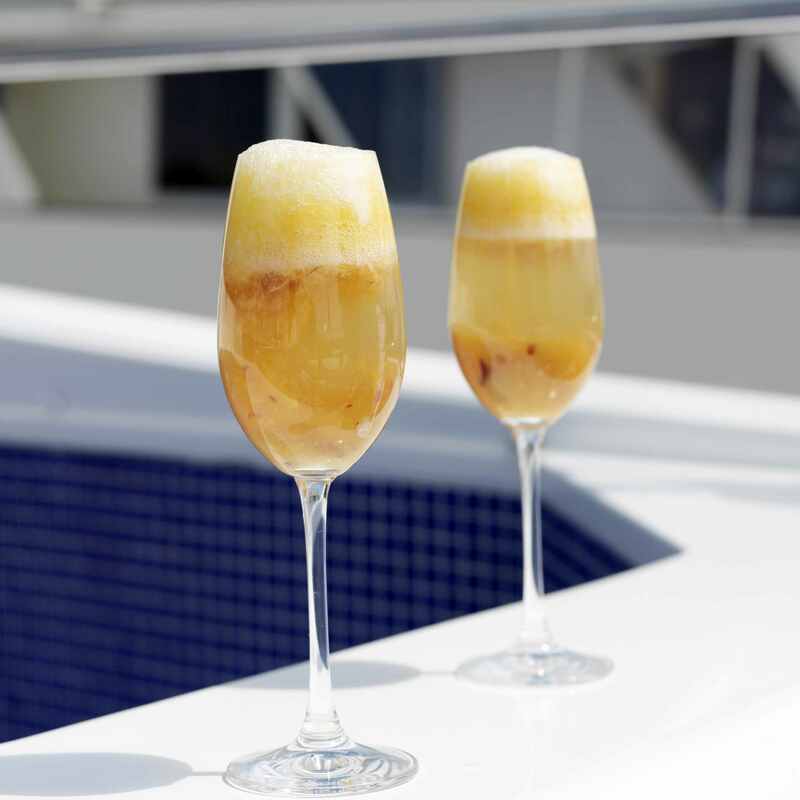 You can choose to use fresh mango or mango-flavored liqueur. As well, it is up to you whether it is shaken or blended as a frozen cocktail. In the red lotus ​cocktail, the distinct flavor of lychee is accented with the lighter taste of cranberry. It is an interesting play of tastes that is both intensely sweet and delicately refreshing. The lychee nut is a prized fruit in China and has a rough, red exterior that must be peeled. The inside looks similar to a peeled grape and has a flavor similar to grapes combined with watermelon. This intriguing spicy cocktail pairs Absolut Mango Vodka with mango nectar, agave nectar, and hot jalapeno peppers. The sweet and spicy mix nicely, but just be sure to keep to the amount of jalapeno called for in the recipe (or even less if you don't care for much heat). Unlike spicy food, a cocktail with too much of a kick can be unpalatable. Lychee nuts, sugar, and lime add flavor to a martini made with pear-flavored vodka and Japanese sake. You will need to muddle some of the ingredients first, which will take some time, but the resulting balance of complex yet delicate flavors makes it all worth it. Adding a slice of pear as a garnish makes this drink not only delicious but beautiful. This luscious and sweet cocktail features Lichido Liqueur, a fruity blend with vodka, Cognac, lychee, guava essences, and white peach juice. The garnish is a single lychee which can be found, canned or fresh, at most Asian markets. If you're a fan of lychees you will truly appreciate the flavors of this unique variation of the martini. Developed in Singapore in the early 1900s, the Singapore sling is a smooth, slow, sweet cocktail. The original recipe was forgotten and had to be recreated, so there are several variations of this drink. This recipe includes Benedictine and cherry-flavored liqueur, as well as club soda, but others feature pineapple juice, grenadine or Cointreau. Mai tai translates from Tahitian to mean "out of this world." A fitting description for this rum tiki cocktail, which originated at Trader Vic's in Oakland, California. The blend of light and dark rums, lime juice, orange curacao, and almond-flavored and simple syrups will transport you to a tropical island, relaxing under a tiki hut, of course. A pineapple and coconut delight for hot days, the chi chi is a wonderful tropical frozen cocktail that is something a little different than the average slushy drink. Similar in flavor to a pina colada, the chi chi uses blue curacao and vodka. Feel free to try coconut vodka or another flavored vodka such as raspberry. The crouching tiger is another drink inspired by the lychee nut. With just two ingredients—lychee liqueur and tequila—this shooter is pretty to look at and a pleasure to drink. Perhaps too pleasurable, so keep track of how many you enjoy. Lychee liqueurs vary in color, so depending on which brand you buy your crouching tiger shooter can be pale pink or brilliant red. When mixed, this punch looks like a tranquil blue lagoon and has the potential to be a stunning presentation with the right punch bowl and impressive garnish. Simple to make, this three-ingredient punch is ideal for summer parties when you don't want to mix cocktails individually. The seltzer or club soda adds a bit of fizz to the lychee liqueur and blue curacao. For guests looking for something non-alcoholic, or even the kids at the party, here is a mango flavored variation of the classic Orange Julius. A combination of mango juice, milk, vanilla, sugar and vanilla ice cream is whirled into a frothy delight. Ideal on a hot day--like an ice cream treat in a glass.